Two of the country’s most highly rated landscape photographers were present for the opening of the Take a View – Landscape Photographer of the Year exhibition at Moors Valley Country Park, near Ringwood on 11 October. The exhibition features a wonderful collection powerful images from across the country. On display at the Park until 24 November, it includes the work of local photographers whose images range from Portland Bill to the Wiltshire countryside, New Forest pines and Holes Bay in Poole. For the opening night, ‘Your View’ category winner David Baker entertained an audience of over 60 guests with a stunning selection of his work and an inspirational talk about the way he selects his shots. 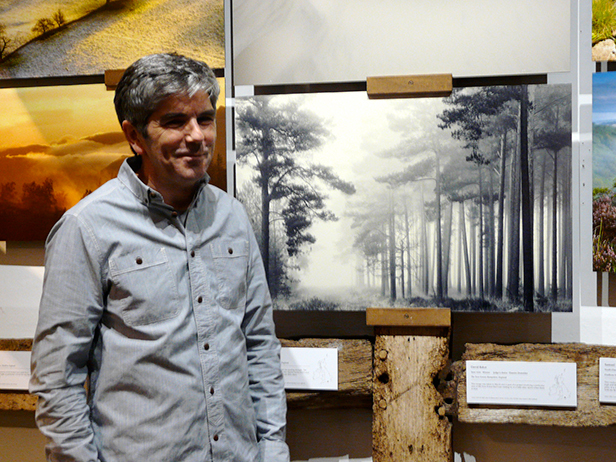 His category-winning photograph captured the magic of misty New Forest pine trees. “It can take months to really know the area you are shooting in,” said David. “With trees, the trick then is to make some sense of the chaos in the forest. For this series of shots I looked for three or four strong graphic shapes and then tried to balance light and dark against each other with a beam of light moving through the image. It’s gratifying to know the judges appreciated my approach”. The Take a View – Landscape Photographer of the Year exhibition features over 60 winning and commended images chosen from thousands of entries. Admission is free although parking charges do apply. For more information call 01425 470721 or visit www.moors-valley.co.uk.